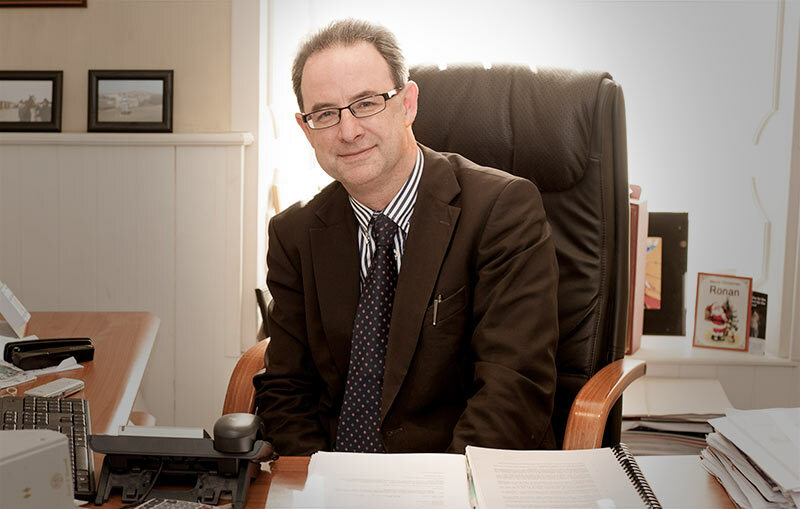 In regard to our areas of experience Ronan Connolly has been in practice as a Solicitor since 1989. His areas of specific expertise are company commercial, commercial litigation in this regard he is a highly experienced litigator who has over 20 years experience in the resolution of disputes. He has been engaged in adversial litigation at the highest level both here and in the UK. In the UK he worked with a Central London law firm based in Lincoln’s Inn Fields in the late 80’s early 90’s where he was exposed to a very wide variety of work and acted on behalf of some extremely high profile and high net worth clients. Dealing in conjunction with senior partners with high value cases in the Royal Courts of Justice Strand, London. At this time he also acted on behalf of the Official receiver of the UK and many private bankruptcy trustees, advising on complex personal bankruptcies and in addition company insolvencies and was involved in many restructuring projects utilising the mechanisms laid out in the English 1986 Insolvency Act which was a pre-cursor to all of the modern legislation which has now been enacted in Ireland with a view to dealing with the financial crisis. Ronan has always been conscious of focusing on the end goal and the client’s best interests. If that involves conciliation or a negotiated settlement for one of a myriad of reasons then he is happy to engage in this. He is also a highly experienced negotiator and is a trained mediator having obtained the status of an accredited mediator with the Mediation Forum Ireland in June 2011. He in particular has become involved in many commercial disputes and has resolved them privately without the need to have recourse to expensive litigation. He has engaged with clients and subsequently organised private mediations where a solution has been hammered out very quickly in the interests of both parties in conflict or indeed has also been involved in the resolution of disputes where there are multiple parties involved. Ronan has particular expertise in negotiating with lending institutions and has also dealt with re-structurings whereby new private equity or loan finance has been introduced in order to save a viable business and allow it to go forward. He has in addition experience in company examinerships where the mechanism originally laid out in the Companies Amendment Act 1990 has been utilised to save businesses where there is a viable core business and restructuring has of necessity to be carried out involving write down of creditors and securing new avenues of finance to allow business to go forward. He was involved in one of the first examinerships under the new 1990 Act and has since been involved in numerous other such cases. He in addition has been involved in acting on behalf of liquidators appointed by the Irish Revenue and dealing with said cases in the High Court as well as dealing with voluntary liquidations organised by contributories in a company and in addition has designed and implemented many voluntary schemes of arrangement whereby a company can reach a resolution with it’s creditors privately without recourse to any Court action. This is a broad outline.